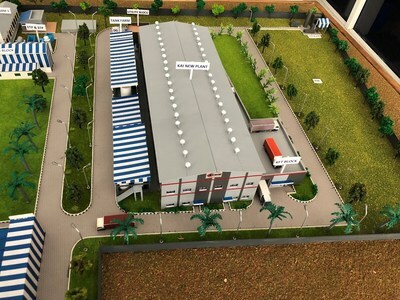 GUMMIDIPUNDI, India, March 25, 2019 /PRNewswire/ -- Kemin Industries, a global ingredient manufacturer focused on improving the quality of life for more than half the world's population, announced today the expansion of its manufacturing facility in India, located in the SIPCOT industrial estate. This will allow Kemin to better serve the increasing demand for specialized nutritional ingredients that address the region's rapidly growing animal protein industry. "South Asia plays a very important role in the global animal feed market, producing more than 35 million tons of compound feed. Due to rapid economic growth in India, Bangladesh, Sri Lanka and Nepal, the overall demand for animal protein is increasing in the region," said Dr. Chris Nelson, President and CEO, Kemin Industries. "For this reason, we decided to invest and grow the capacity at our existing Gummidipundi plant near Chennai. Kemin is always seeking opportunities to better meet our customers' needs regionally and provide high-quality products and solutions. This expansion is yet another example of how Kemin puts customers first." FSSC 22000:2005 – Manufacturing (processing, blending and packaging) of animal feed additives and food additives packed in bulk and retail packs. "We are excited to bring new technologies into our production facility so we can provide customers the maximum benefits of our products," said Dr. R Sureshkumar, President, Kemin Animal Nutrition and Health – South Asia. "I am very glad that we have added capacity to meet the growing regional expectations."